Offshore stone columns have been installed since many years. The critical aspect of this product was always quality control or the lack thereof. The finished product can be visually inspected only by divers and full scale load tests on offshore stone columns are unheard of. It is therefore of paramount importance to rely on a column installation method that leaves no room for defective columns. A large step to improve the quality of the installed columns was made with the introduction of the predecessor of the Betterground Pressure Chamber Injection System (PCIS) at the Port of Patras, Greece, in 2001. Since then the number of projects as well as their technical challenges have increased. 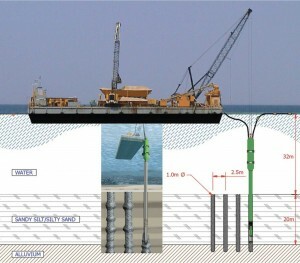 Today millions of meters of offshore stone columns have been installed in over 38 m water depth, with column length of over 25m and diameters that can both be constant over depth or follow a tapered design, with the largest column diameters installed directly below seabed where marine deposits typically exhibit the lowest strength. The Top Feed Stone Column installation method relies when executed on land on a differential water head between the Stone Column point and the surrounding soil. It is known from land based projects where the groundwater table was very close (≈ only 0.5 m or less) to the working platform, that feeding of gravel was difficult to impossible. 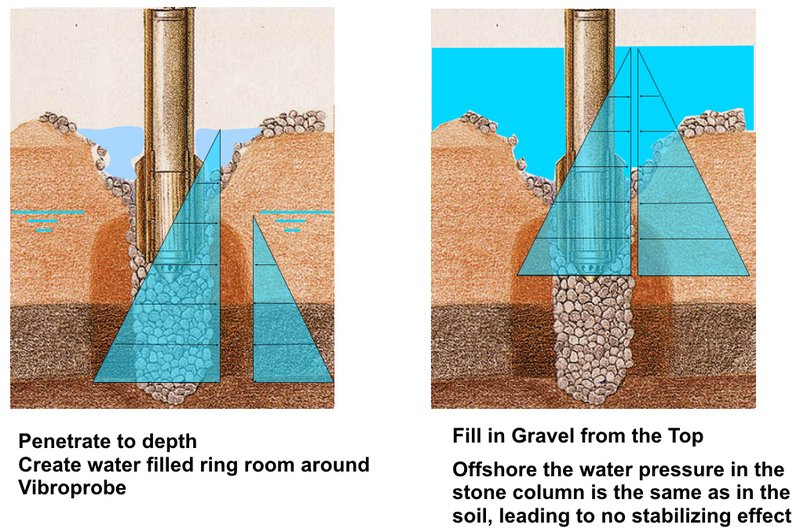 Offshore the water table in the soil is always the same as in the stone column point, since both are under water and the common “water table” is the surface of the ocean. up and down movement of the vibroflot that is so successful in the land based Top Feed Stone Column method. vibroflot is offshore much more likely than onshore. As an added challenge, the flow (or non-flow) of gravel towards the vibroflot cannot be observed offshore as readily as onshore. This are the reasons why it is recommended to apply whenever possible in offshore projects a method that is based on Bottom Feed gravel transport. The Betterground PCIS is the latest evolution of marine bottom feed stone column installation equipment. As shown in the illustration, gravel is transported via a 6-inch gravel hose. In a variant of this system, the gravel can alternatively be placed into the hopper by a bucket. Key to the PCIS is the airtight gate on the top of the receiver tank that locks the gravel from atmospheric pressure and puts it under an over-pressure that ranges between 2 to 6 bars, depending on the operating depth of the rig. Under the applied excess air-pressure in the interconnected chamber consisting of receiver tank, silo tube and tremie pipe, gravel is injected into the soil at the tip of the tremie pipe near the Vibroflot’s nose, hence the name “Pressure Chamber Injection System”. Compared with a Single Large Tank System, the advantage of the PCIS is that below the gate there is always exactly one full batch of gravel filled in with each opening of the airtight gate. This not only allows for few open-close cycles of this gate, but also for a most accurate recording of gravel batches placed in the ground at defined depths. In an aptly named “Double Lock” variant of the same system, two airtight gates enclose the receiver tank on its top and bottom end. The following picture shows one of the earliest setups for a project in Patras, Greece. More recent setups are given here.